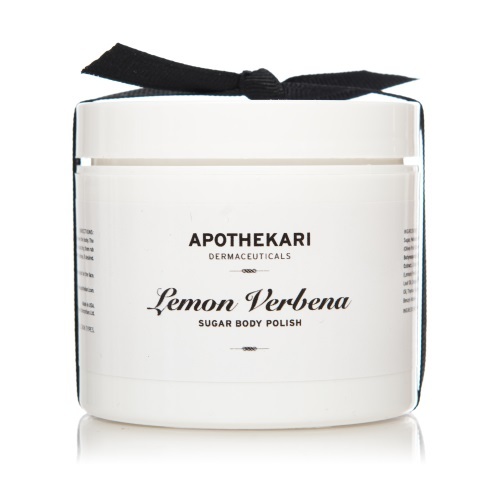 Lemon Verbena Sugar Body Polish – NEW! We’re excited for you to try our new Lemon Verbena Sugar Body Polish (105 g/3.5 oz). Our sugar polish has a bright, aromatic citrus scent and is ideal for aromatherapeutic body treatments or a little pampering in your bath. Unlike most sugar-based scrubs, our body polish is smooth and never drips excess oil, so it’s easy to apply. Made with a base of shea and olive fruit butters combined with virgin coconut oil, this body exfoliator has a unique emulsified texture. Shea butter is a remarkable, all-purpose moisturizer and skin protector, and leaves the skin feeling soft and well-moisturized yet not greasy. Non-GMO, expeller-pressed safflower oil adds nourishment and suppleness to dry skin. We also include pomegranate seed extract, produced by supercritical carbon dioxide extraction to deliver a pure source of tocopherols, sterols, and a small amount of squalene, which is normally present in our body’s natural oils. Known to calm and heal irritated, dry, and sensitive skin, this extract promotes the skin’s self-repair system and stimulates regeneration, which in turn improves elasticity and protects against aging. Apply polish to wet skin in a circular motion. Start with arms and move down the body. The fine sugars will melt as you work your way through each section. Rinse lightly and pat dry, then rub in any lingering butters and oils. Apply additional lotion or crème, if desired. This product is not recommended for the face.